Greetings from World Wide Education Bhopal!!! 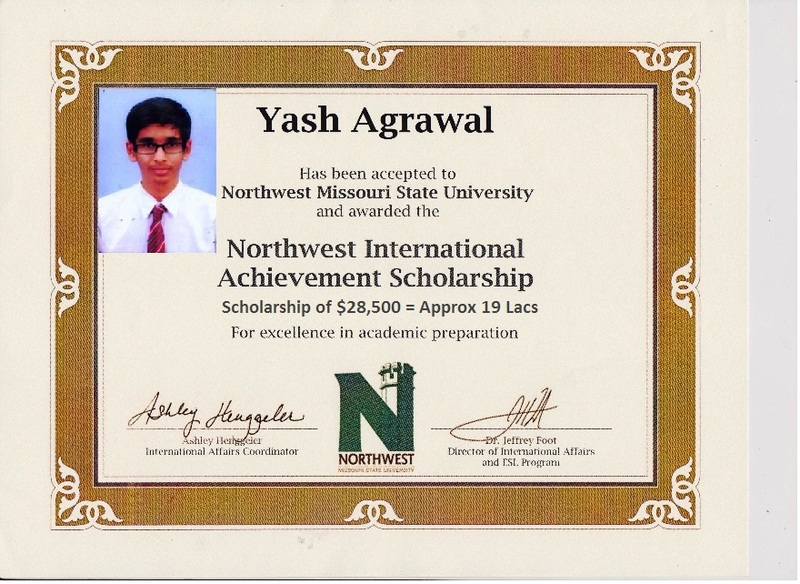 Our student Yash Agrawal secures $ 28,500 scholarship: World Wide Education proudly congratulates its student Yash Agarwal for securing a gargantuan ‘Northwest International Achievement Scholarship’ of $ 28,500 (Around 19 Lac INR) for ‘Excellence in Academic Preparation’ from the reputed Northwest Missouri State University. The scholarship covers the cost of his education for five years. This success is not just a flash in the pan as is evident from the fact that Yash has also received admission offers from other eminent universities such as Cleveland University, Southwest Missouri State University and California State University. Yash joined WWE as a greenhorn in grade 11th and is now awaiting his grade 12th result. This scholarship is indeed an ace up his sleeve as he has got magnificent offers from world renowned colleges even before the declaration of his class 12th result. In Yash’s own words “My education is something that is very important to me and cardinal to achieve success in my future. Winning this scholarship only strengthens my belief that joining WWE was the best decision for my future. This scholarship will allow me to open up new doors to learn and continue pursuing my degree in hopes of graduating and then joining Google or Microsoft. I am so grateful to WWE for this amazing opportunity." 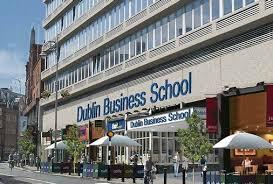 The aim of the MSc in Marketing is to enhance the prospects of its graduates in the job markets and enable them to obtain entry into a variety of roles ranging from junior executive to senior marketing positions in a range of organisations both nationally and internationally. The programme is at Level 9 on the National Framework of Qualifications and with the combination of taught and research stage, It provides added value for both learners and employers. The programme is academically challenging and strategically relevant in advanced marketing and will equip students with current and emerging theories that inform and comment upon the new practices of marketing within the digital media arena. The MSc in Marketing is a programme which has been purposely created to meet the needs of recently qualified business or marketing graduates. It seeks to further enhance students existing knowledge of marketing theories and practice, and who aspire to pursuing challenging senior career opportunities in the marketing profession. In today’s maturing and competitive marketing landscape, this MSc in Marketing will equip students with the knowledge and skills necessary at senior level marketing positions. · Bachelor’s Degree in relevant field as per the course. €1000 euro off level 9 programme. With immediate effect, the Irish Government has agreed to extend the stay back option for international students. The new permission will double the ‘stay back option’ for masters and PhD students from 12 months to 24 months. This will allow eligible graduates who have studied in Irish higher education institutions and whose award is granted by a recognized Irish awarding body at Masters or PhD level to remain in Ireland for two years to seek employment. Optional Practical Training (OPT) is an outstanding professional and academic benefit of completing a full degree program in the United States. OPT allows up to 24 months of practical training to foreign students enrolled and participating full-time in a U.S. college or university on an F visa, the most common visa type for academic studies. After being enrolled one full academic year, a student may be authorized to participate in pre-completion OPT on a part-time basis while school is in session, or full-time when school is not in session or upon completion of studies. A Designated School Official (DSO) at the United States college or university where you are enrolled must approve OPT before you can receive your Employment Authorization Document. Students of science, technology, engineering, or mathematics (STEM) may apply for an additional 12 months of OPT for a total of 36 months. That is more than three years! How long is the opt? Training/work can be completed anywhere in the U.S. after the OPT EAD card is issued. Standard OPT is available for a cumulative maximum of 24 months per educational level. A one-time extension of 12 months (for a total of 36 months) is available to certain STEM degree recipients. How long does it take to get an opt? Authorization for OPT is granted by USCIS and processing can take up to 3 months. Therefore it is important that you apply for the authorization well in advance of the date you wish to start working. You may apply up to 90 days before completion of studies and NO LATER THAN 60 days after. How long do I have after my OPT expires? Q: How long can I stay in the U.S. after my post-completion OPT ending date expires. A: You have a 60 day grace period following the end of your OPT period, unless you have extended your F-1 status for another degree program, or you are under application to change your immigration status to another classification.